One Month Until the On-Island Alumni Reunion! Less than one month until the alumni reunion on-island, September 25-27. Come back to the sea to visit your querencia, hug all your favorite kitchen ladies, snorkel at 4th hole and dance the night away to the Rum Runners! It’s not too late to RSVP! Email cameronpowel@islandschool.org. 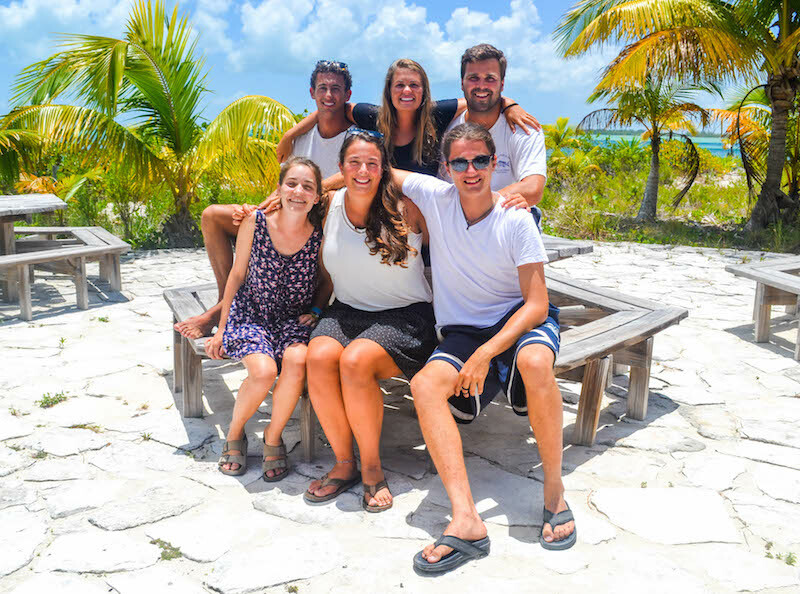 We want to welcome back all of The Island School alumni who have returned to Cape Eleuthera and giving back this summer! This summer, Griffin Hunt (F’11) is working as a Summer Term Alumni Mentor at The Island School. He is co–leading the Tourism and Development unit, a course which explores the history of Eleuthera and the underlying socio–economic factors that have impacted its development through two–night down–island trips and participation in relevant CEI research. Specifically, students will be exposed to political philosophy, ethnography, and tourism practices, along with two conservation–oriented field days with CEI researchers. In college, Griffin is pursuing a double major in Public Policy & Law and Philosophy. In addition to teaching the T&D unit, Griffin serves as an advisor to a group of students and an EMT and is co–head of the Boys Dorm. This is Griffin’s third summer at The Island School and he is psyched to spend the term with a remarkable faculty team and 50 passionate students. Kristin Treat (Su’10) is going to be a senior majoring in Marine Biology at Florida Institute of Technology. She is a shark conservation and research intern this summer at CEI. She is so excited to learn and get field experience during my time here. Kristin loves traveling, scuba diving, and trying new things. Maggie Winchester (Su’11) is a shark intern from Vermont. She studied abroad in Morocco, and in the spring Maggie will be graduating from the University of New England. She is really excited to be back in Eleuthera and be working with sharks again. Christian Daniell (F’10) is back as an intern with the Shark Research and Conservation program at CEI. He mostly lives in the UK, and I is currently going into his fourth year at Connecticut College. This is Christian’s third time on the island, his first being in 2010 as a student, then in 2012 as an intern. Christian is looking forward to getting out there and tagging some fish and help out in any way he can. Chase Goldston (Su’13) is interning with the Flats team this summer. He is going into his sophomore year at Colby College. Chase is from Chagrin Falls, Ohio, a suburb of Cleveland. He is a big Cleveland sports fan and loves dogs and being outdoors. Emilie Geissinger (S’08) is a summer intern with the Flats Ecology Team. She graduated from Bates College in 2014. This past year she taught high school Biology at the Noble and Greenough School. She is very excited to be back in Eleuthera and participating in the awesome research going on here! Emilie plays water polo with a team in Boston and participates in sprint triathlons for fun. Anna Jenkins (S’12) is in her third year at UC Berkeley and grew up in San Francisco. Anna is back at IS working with the Reef Ecology and Conservation research team and am very passionate about conservation regarding marine life and energy. Anna’s hobbies include soccer, dance, and generally being outdoors. 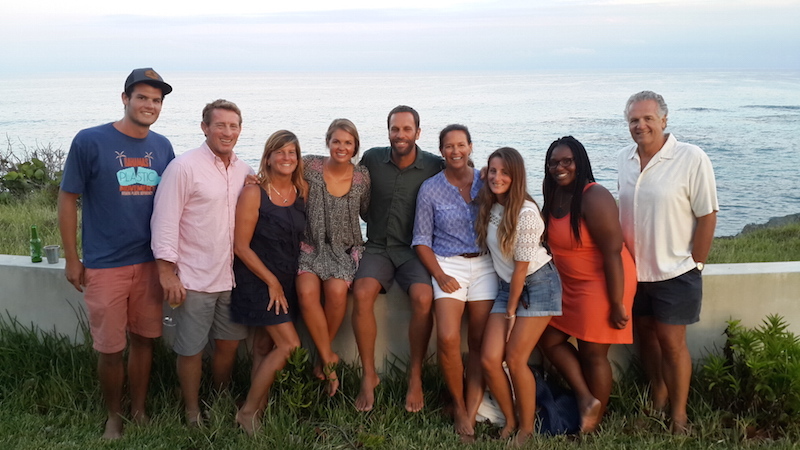 James Boyce (F’12) is back on Eleuthera and working as an intern in the Boathouse. He spent the first part of the summer on the 5 Gyres sailing expedition from Bermuda to the east coast of the US and is psyched to be back and helping out. Dana Biddle (S’13) is very excited to be back this summer. 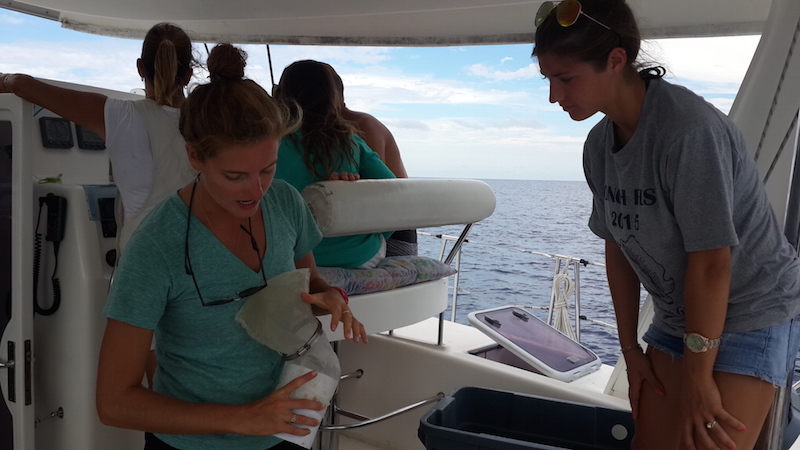 During her semester, she worked with Jocelyn on the lionfish and lobster research project. She is back working for Jocelyn on the Sustainable Fisheries team. Dana will be a sophomore at the University of Miami next year and is studying Marine Science. Dana Colihan (S’12) is a Reef Ecology and Conservation Research Intern this summer. She was born and raised in New York City although Dana is currently attending Oberlin College in Ohio. She is an Environmental Studies major and a rising junior. Dana like bagels, fixing/riding bikes, and works at a Living Machine at Oberlin. She is super excited to be be back and to be doing work on sustainable fisheries this summer! A big crew of Fall 2010 alumni! Aly Boyce (F’10) is working with the Sea Turtle team for the summer. She is originally from Abaco- just one island north of Eleuthera! Currently, she is a rising senior at UC Berkeley double majoring in Political Science and Environmental Science. She is looking forward to getting to spend time with old friends and getting to meet many more! She also hopes to be able to explore Eleuthera and freedive as much as possible. Brandon Gell (F’10) is currently a rising senior at Middlebury College in Vermont. This summer he is working at CSD working on creating a the framework for a sustainable design competition to be held at The Island School. 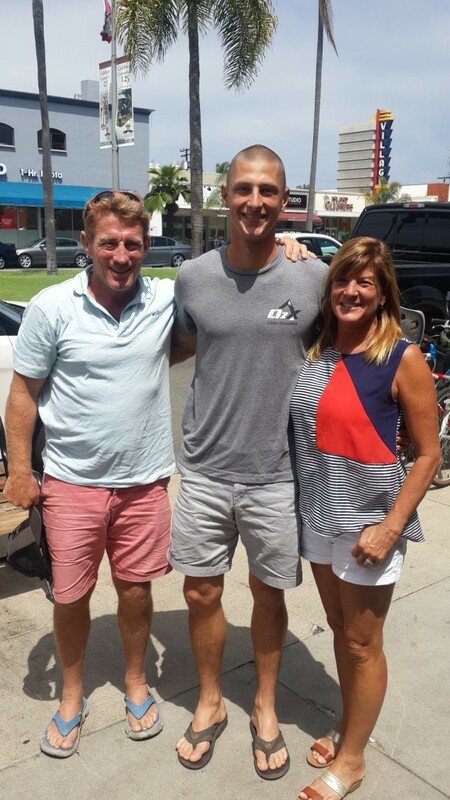 Brandon is psyched to be back here and is looking forward to catching up with old friends and making many new ones. Ryan Schendel (F’12) is working as a general systems intern at CSD. He is studying Sustainable Environmental Design at UC Berkeley. His project this summer is to connect the water cisterns underneath CSD with the pipe system throughout Island School Campus and CEI. Tamara Pletzer (S’12) is the aquaponics intern this summer. She is a second year at University of Edinburgh and is studying economics and math but originally hails from Colorado. Tamara loves scuba diving, swimming, among other activities and is looking forward to learning more about the aquaponics system as well as how to create the beds, grow tilapia and try growing different plants in the system! Whit Powel (S’09) is back for her third summer teaching, advising, and shaping the young minds of Summer Term students. This summer, she will be teaching the Sustainable Systems unit, advising, co-heading the Girls Dorm, and fulfilling the role of Dean of Students. Her hometown is Shaker Heights, Ohio and she graduated this spring from Denison University. Catharine Pirie (F’10) will be returning for her second summer working as a Tourism and Development teacher, advisor, and co-head of Girls Dorm for the Summer Term students. She is from Hamilton, Massachusetts and is currently a senior at Hobart and William Smith colleges. Catharine is so excited for yet another amazing and exciting summer here! Tori Suslovitch (F’11) is a rising Senior at the University of Tampa where she studies Biology with minors in Chemistry and Education. This is her first time back on Eleuthera since her semester and she is excited to help teach Marine Ecology for the Summer Term. Meaghan Kachadoorian (F’10) is from Connecticut and goes to school in North Carolina. She is really happy to be back and teaching Summer Term for the Tourism & Development and Sustainable Systems units. Katie Gougelet (S’08) is from Hanover, New Hampshire and a recent alumna of Dartmouth College. This is her first summer back to Eleuthera since Spring ’08 and she is excited to be here helping to teach and and get involved with all aspects of the students’ summer experience. Max Maloberti (S’10) is a Biology major and Junior at Dickinson College, PA. He is back teaching the Marine Ecology unit. Ever since his semester, he has been wanting to come back so he is really excited for this summer. Liam Macartney (F’13) is back and excited to be working with the Educational Programs team. George Giannos (F’10) is back for his 5th time since his semester working in CSD and helping oversee all of the interns at CEI and CSD this summer. Meagan Gary (F’07) is a Masters student at Florida Atlantic University and this summer/fall she will be comparing the home range and habitat use of different sized immature green turtles at CEI. After graduating from Colorado College where she majored in Biology, Meagan returned to CEI and was the sea turtle research assistant. Mike Cortina (F’02) has been working at CSD for 1.5 years as a Sustainability Teacher. 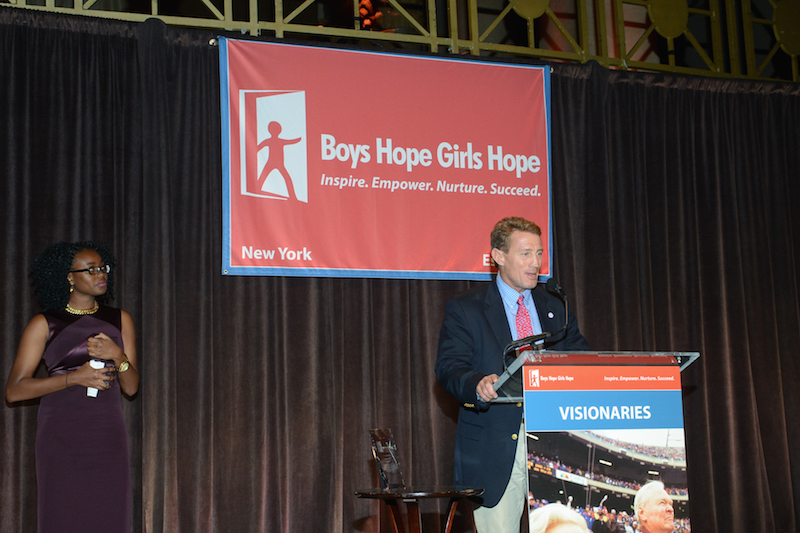 Stanley Burnside (F’07) is a lead educator with CEI’s Educational Programs. 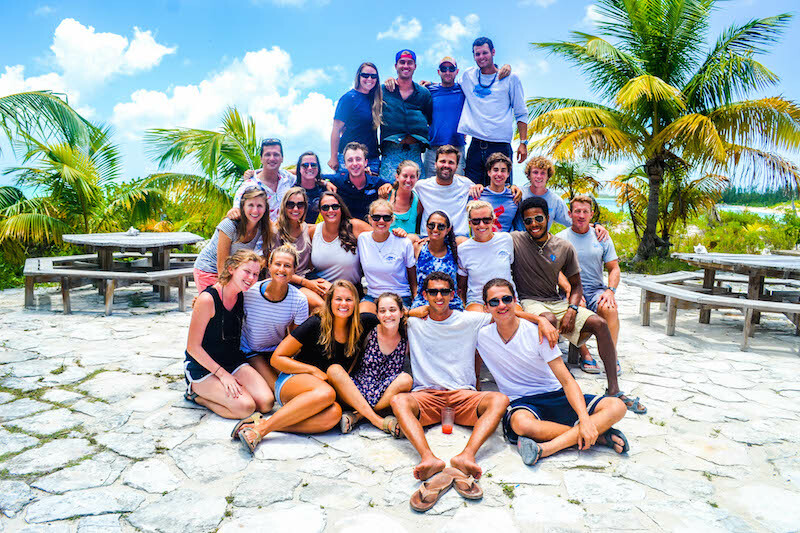 Come back to the sea and join us for The Island School alumni reunion September 25-27, 2015 on Cape Eleuthera. Visit our website for more information or email cameronpowel@islandschool.org for questions or to RSVP. Island School connections are everywhere! We recently heard from Fall 2005 IS alumna Katie Romanov and Spring 2010 alumna Emma Payne who are working together on an incredible project–to bring a nonverbal boy a voice! Emma recently began working for VocaliD which is a start-up that creates personalized synthetic voices for people who can’t speak, so they don’t have to rely on the same limited set of generic, robotic-sounding voices. It’s very common that kids who rely on communication devices to talk often end up having around 5 other kids in their class using the same exact voice as them– it’s not only confusing, but communicating with such a generic, robotic voice hides a huge part of one’s identity. 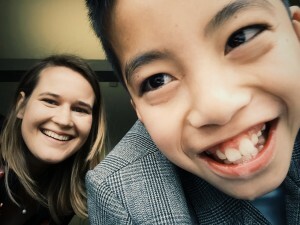 Katie emailed the central VocaliD email account, which Emma is in charge of answering, and her story about her student Simon, a nonverbal 5th grade boy from San Francisco immediately made Emma want to do whatever she could to join Katie in helping Simon get his own communication device, communication software, and his own voice. Katie and Emma exchanged many, many emails as they brainstormed how to set up Simon’s Indiegogo Life fundraising campaign, and when Katie connected with VocaliD’s page on Facebook, Emma noticed that they had a mutual friend–The Island School–and they soon we realized that we were both IS alumnae, 5 years apart! To learn more about Simon and his journey to get a voice, visit Katie’s Indiegogo page and watch this video of Simon in action! 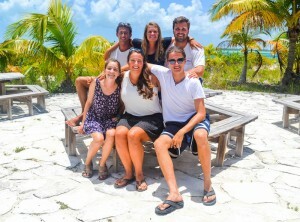 Our Island School alumni have gone on to do some incredible things since their time with us on Eleuthera. Read below to hear about what some of them are up to now! To submit your own class note, email alumni@islandschool.org. Monique Johnson is training for the Spartan Sprint race in a few weeks. It’s an obstacle course race that involves 5+ kilometers and 15+ obstacles. It’s the closest thing to an Island School run, bike, swim morning workout. Monique says to all her S’00′ers changing the world one day at a time… keep up the good work and she hopes you are enjoying the liberty of life wherever you are in the world! Meg Bunn will be starting an executive MBA program at UVA’s Darden School of Business this coming fall. She met up with Mary Coleman Farrell in NYC in May. Mary Coleman Farrell recently moved to Richmond, VA with her husband and two children. 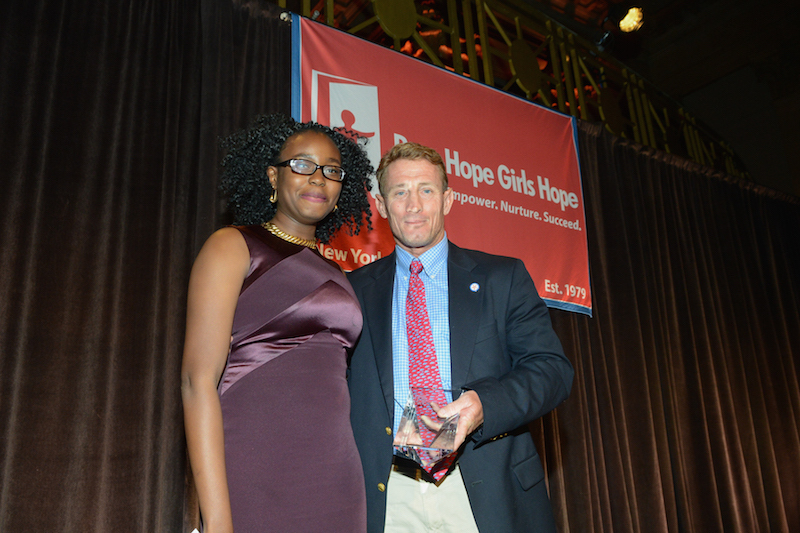 Congratulations Candice Springs Hipp (S’04)! 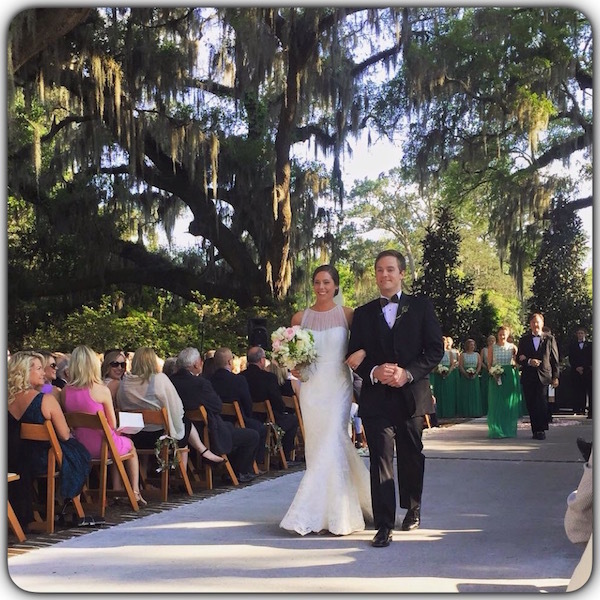 Island School Spring 2004 alumna Candice Springs got married earlier this month on May 2nd in South Carolina to her now husband Will Hipp. Candice wanted her favorite place, Eleuthera, to be represented at her wedding so she served Kalik, the beer of The Bahamas, and conch fritters at the reception! Chris Maxey’s son, Brocq Maxey works for a company in Cape Town, South Africa called Shark Explorers (http://www.sharkexplorers.com/), which offers unique shark diving and view expeditions. Their philosophy is to change peoples’ perspectives of sharks and protect them as the ocean’s ultimate predator. 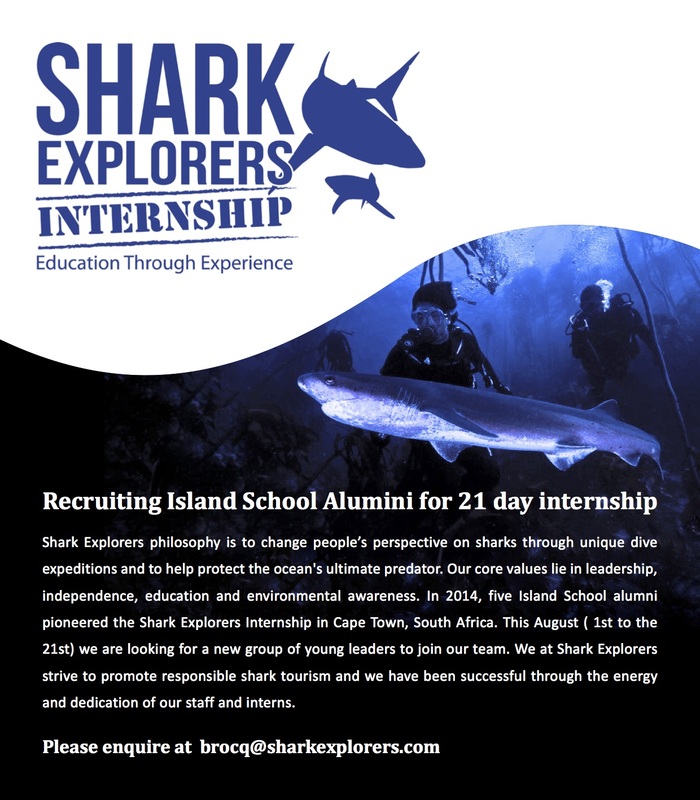 Shark Explorers is currently seeking interns, specifically among Island School alumni 18 and older this summer, August 1-21. See below or click here to learn more. If you are interested, email Brocq at brocq@sharkexplorers.com.